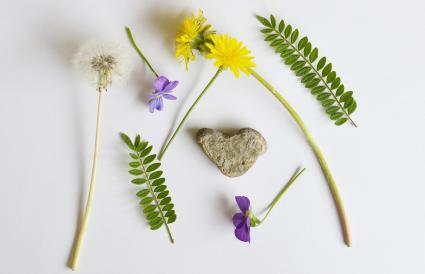 As the seasons change, you may need spring ideas for preschool children to put on a school bulletin board. Creating a bright spring bulletin board can be both a learning experience and a creative endeavor for preschool children. A colorful bulletin board is a wonderful decoration, and possibly learning tool, that lights up any room. 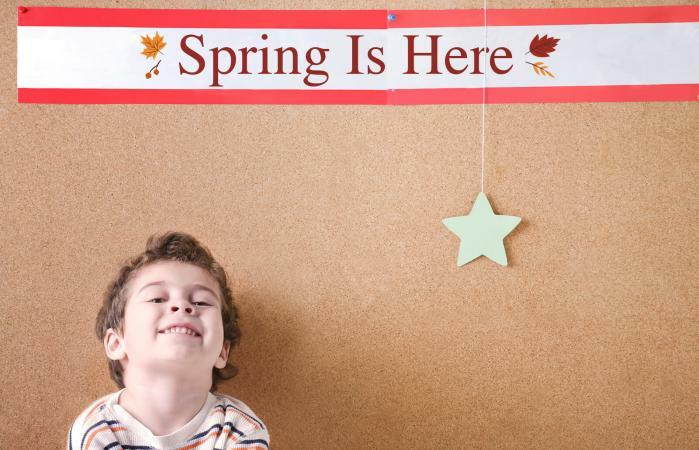 Say goodbye to winter with fun spring bulletin board ideas for preschool students! Spring starts every year in March at the vernal equinox when hours of sunlight and darkness are equal. It is a time of renewal, when the cold and dull days of winter give way to new life, such as flowers and baby birds. Spring also brings interesting weather changes and patterns that provide terrific learning experiences for young minds as well as the return of Daylight Savings Time and the Easter holiday. With all of these themes, it is easy to come up with spring ideas for preschool children to put on a bulletin board. Make a giant I Spy game for passers-by or classroom downtime. Use the phrase "I Spy Spring" as your title. Take kids on a nature walk or two and ask them to collect small natural objects (not anything alive) such as stones, leaves, seed pods, flowers, or twigs. Cover the bulletin board with paper and add your title. Draw a rectangle near the top of the board. This is where you will write in items to search for. Help children use the adhesive materials to stick their natural finds all over the board (except in the rectangle you just drew). The more items you have and they more diverse they are, the better. Optional: Add in clipart, magazine photos, small toys, stickers, or small crafts that include common spring plants, animals, or items to fill the empty space. Write specific items now stuck on the board in the rectangle to serve as prompts for what to "spy." As people look at the board, they can "spy" different items. Kids can even challenge others to find specific items like a red leaf or stick that looks like "Y." The title, "We herd ewe like Spring?" is the perfect funny caption to this three-dimensional sheep bulletin board that's truly unique and incorporates the Easter craft, egg carton sheep. Cover the bulletin board in green paper to represent a grassy field and add the title. Cut an egg cup out of an empty egg carton for each student. Kids place the egg cup open side down and cover it with glue. Next, children stick cotton balls on the egg cup until it is completely covered. Then they decorate with craft eyes and ears cut out of construction paper. Once the little lambs are dry, adults can use hot glue or removable mounting putty to help kids stick their sheep to the bulletin board. Spring brings tumultuous weather and big changes that come with stronger sunlight and days that grow longer. It may be interesting for children to observe the weather in the springtime and note what they see on a large calendar with the caption "We're Ready for Any Weather!" Draw a calendar for each month on a large poster board. Tack the monthly calendars to the bulletin board. Put small strips of Velcro in each square. On construction paper, kids create several icons for different types of weather, such as a sunshine, clouds, rain, wind, thunder, hail, and tornados by tracing the stencils then cutting them out. Place Velcro strips on the back of the weather icons. Each day, have the children look outside and observe the weather, and then place the appropriate icon on that day's date. Images of kids doing cartwheels challenges children to properly sequence the pictures and make for a fun bulletin board. Add the title "We're Flipping for Spring!" Give each child a boy or girl coloring page they color to look like themselves. Hang the finished pictures around the borders of the bulletin board, leaving the interior space empty. Cut the Cartwheel Sequence Coloring Page into four sections, one for each stage of the cartwheel. You'll want to make sure you end up with complete sets. For example, if you have 12 students you would end up with three full sets. Give each student one section of the sequence to color. Put students in groups of four where there is one student with each section in the sequence. Ask one group at a time to stick their sequence in order horizontally in the center of the bulletin board. Create a book full of spring images with a bunny-face cover then display it on a board that reads, "No Bunny Knows Spring Like (Teacher's Name's) Class!" Have children draw Easter or spring images on each piece of paper using crayons. Cut two rabbit ear shapes out of the white construction paper, and two smaller ear shapes out of the pink paper. Glue the pink ears onto the white, and allow it to dry. Meanwhile, help children draw bunny faces on the bottom of a paper plate in the smooth, round part. Paste the ears to the top of the other paper plate. Put the paper plates together with the top of the plate facing the interior of the book. In the center, place the child's drawings. Staple the plate and papers together along the left edge using two staples. When the book is closed, the book will resemble a rabbit's face. If you'd like, help the children write a simple story on the pages that complements their drawings. Staple the books (in the same place you stapled them together) onto the bulletin board. With the title, "Fluttering Through (Teacher's Name's) Class!" and bright, colorful, three-dimensional butterflies made from coffee filters you'll end up with a beautiful bulletin board. Lay the coffee filters on newspaper and allow the children to paint them using watercolor paints. As they paint, the watercolors will spread in the filter, creating beautiful designs. Fold 1/2 of a pipe cleaner in half. Squeeze together the center of the painted coffee filter and wrap with the pipe cleaner, bending the ends into antennae. Tack butterflies to your bulletin board. 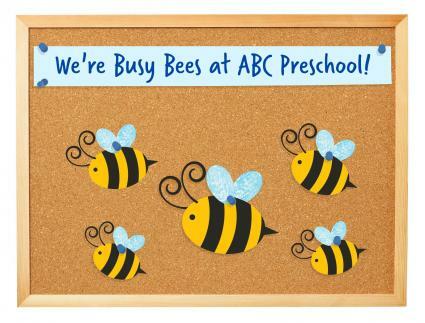 Using the title "We're Busy Bees at (School Name)," create a bulletin board full of cute bees flying around. Kids will create potato stamp bee crafts to display on the board. Make sure to have wet wipes handy or direct kids to wash their hands after each time you use paint on their hands. Cover the bulletin board in light blue paper to represent the spring sky. Paint the phrase "We're Busy Bees at (School Name)!" at the top of the board alternating black and yellow paint for the letters. Paint a child's hand white and have them make a few overlapping handprints in a cluster near the top of the bulletin board. Repeat with all children to make unique clouds in the "sky." Give each child a piece of black construction paper. Kids dip one half of the potato (the flesh side that you have carved with stripes) into the yellow paint then stamp it near the center of their paper. Kids dip one finger in white paint and press their fingerprint two times at the top center of the bee body they created with the potato stamp to make tiny wings. Using the same finger dipped in white paint, children press their fingerprint inside the bee body near the top front for an eye. Kids dip their finger in white paint again and create antennae by stacking their fingerprints in two vertical lines at the top front of the bee body. Optional: Kids glue their headshot photo onto the front of the bee body and make the fingerprint antennae come off their face (which is now the bees face and head). Optional: Children cut out their entire bee about one inch from its body, wings, and antennae. Staple the completed bees to the bulletin board. Turn your entire bulletin board into a dazzling spring garden with the caption, "Growing Together, Growing Strong!" Gather a variety of things you might see in a garden, such as flowers, rocks, snails, ladybugs and butterflies from a variety of sources. Cut a large piece of the brown bulletin board paper that will cover the entire bulletin board. Allow the children to select images and paste them wherever they like in the garden until most of it is well covered with images. Staple the garden to the bulletin board. 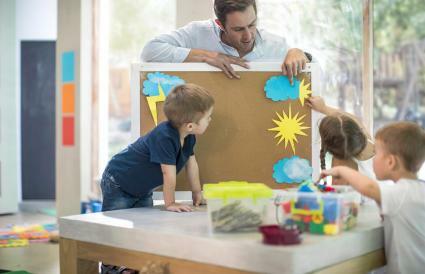 As the world wakes up from winter, children will enjoy a variety of spring activities, including creating a beautiful bulletin board that shows what is going on outside their windows. Spring bulletin boards can be works of art, or they can explore concepts and themes. 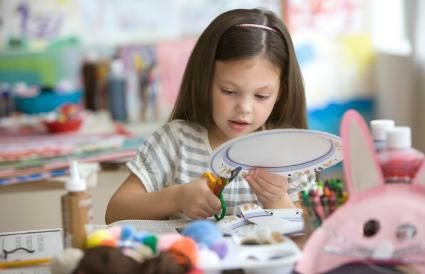 Each item on the bulletin board can also be a child's art project, giving them spring-themed projects to keep them busy creating new crafts or pictures each day.